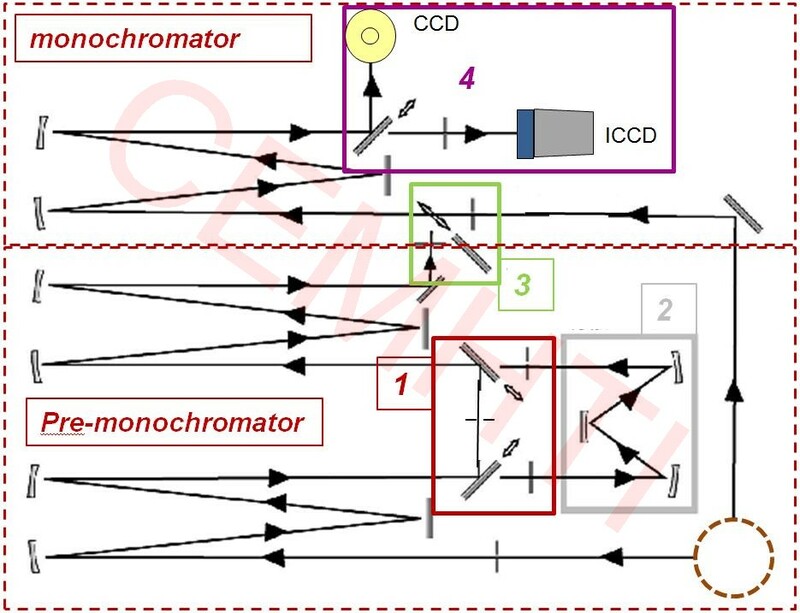 triple subtractive (1 on the following figure): the two pre-monochromator’s gratings are used to remove the Rayleigh light contribution by using an intermediary slit to stop the unwanted light. The inelastic scattered truncated beam is then analyzed thanks to the monochromator. We easily obtain a 10 cm-1 low wavenumber limit in backscattering configuration. triple additive (2 on the following figure): the three grating’s dispersions are summed up in ordre to obtain the best spectral resolution, as low as 0.13 cm-1 (at 647 nm).